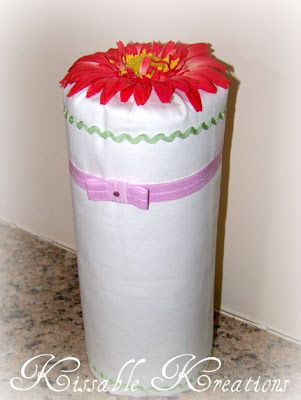 Lu Bird Baby: Kissable Kreations Giveaway!!! I have a weakness for all things girly. ruffles. bows. flowers. the color pink. If you do too, this giveaway is just for you. Meet Lisa, the mastermind behind Kissable Kreations. "Hi, my name is Lisa. 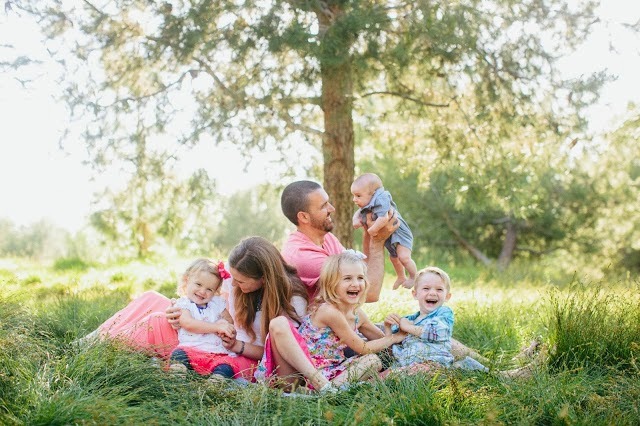 I have been married to my very supportive husband, Jeremy, for 8 years now. I am also mommy to Sophia Rose, my little sweetheart, who just turned 2. Believe it or not, I actually started out as a middle school French teacher. I have been truly blessed to be able to stay home with my daughter for the past two years, and I have LOVED every minute of it. I have always been creative, and she was the reason I started Kissable Kreations. I originally set out to just make my daughter some really cute clips and headbands to go with her outfits, and everyone started asking me where I got them. Then I started getting requests to make things for my friends and my friends’ friends. Then I discovered ETSY, and oh boy, was I hooked! The rest is history… I now run a very successful Etsy shop, and I also supply local boutiques and salons with my accessories as well. 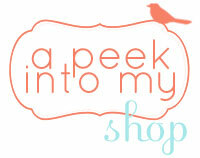 I LOVE what I do, and I hope you enjoy your visit to my little Etsy shop. It is chockfull of love and little girl yumminess!" This flower beanie is so stinkin adorable I can't stand it. I'm a sucker for babies in headbands. When Mackenzie was a baby she wore one every.day. I wish she had this pink beauty. Classic flower with the vintage gem. 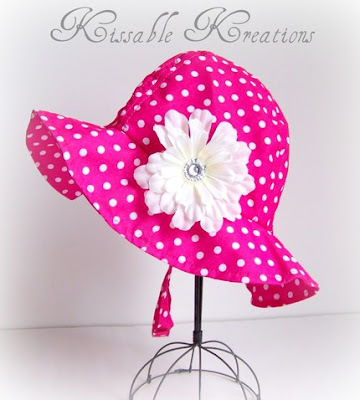 Hot pink with white polka dots. These fun and sassy tutu headbands add just the right amount of spice to an outfit. Every headband lover needs a place to store and show off her head bling. 4. Leave a comment telling us why you love being a girl! 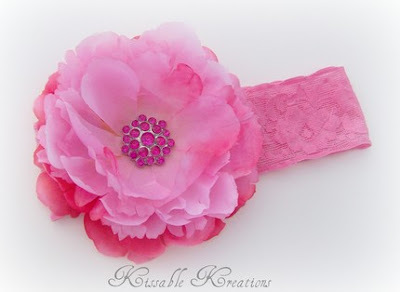 I LOVED the Shabby Chic Vintage Jewel Flower Stretch Handband in hot pink!! I have an 8 month old granddaughter that would look absolutely precious in it!! I love being a girl (really a grandma) because it gives me the freedom to create really cute things for my grandkids!! Really, it's my husband who gives me that freedom since I don't have to work outside the home!! Love it!!! Oh my! Maddie is definitely getting one of those Beanies for Christmas! Too freaking cute! I follow Lu Bird Baby! I LOVE being a girl because I can wear pink every day! I am such a girly girl and super lucky Maddie is too! 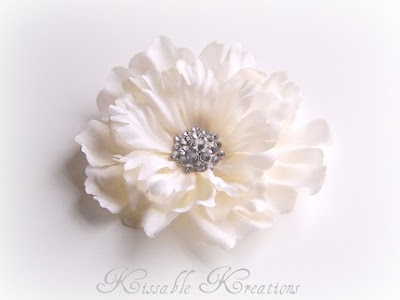 I LOVE LOVE LOVE the Cream Flower accented with Hot Pink Rhinestone Button & Hot pink lace headband, its to die for!!!!!!!!! I love being a girl because I love being a mommy. The tutu headhands are too cute! I can all ready seeing my daughter wearing it! Why do I love being a girl? I love being a mom! 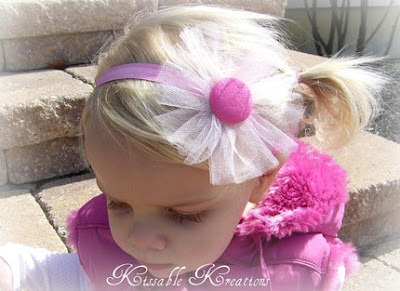 I love the cabbage rose stretch headband in peach. So adorable! I'm going to have to say the same thing. I love being a girl because I love being a mommy. I love, love, love the flower clips- so elegant!!! I'm loving the tutu headbands - my daughter doesn't have nearly enough hair for bows so I must resort to headbands. This one is SO cute! I love the hot pink flower head band! Too cute! I follow Lu Bird Baby now! I love the brown beanie with cream flower! Just adorable. I love being a girl so I could be a mom! I love the crochet beanie with the peony! So cute! Pink is so wonderful...yeah for being a girl! I love the Yummy NEOPOLITAN ICE CREAM Colors Hair Clippie Trio. So cute! 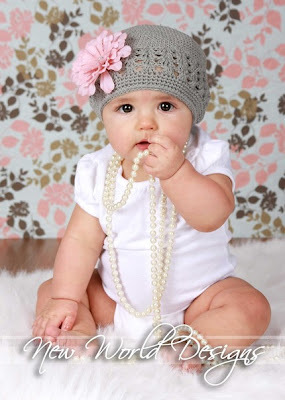 I LOVE the White Magnolia Crochet Hat accented with VINTAGE GEM. I heart the seller and item. It is soo cute. Thanks for the giveaway. I became a "follower" of blog "Lu Bird Baby." Thanks! I love being a girl because were so cute and smart. I have 3 girls myself. for me or for my very young sister (she's 6) or maybe we could share! i love being a girl because i can experiment with bright colors and jewelry and makeup...or not. i have a choice that most boys don't! so i'm gonna take advantage of it! My fave is SWEET Navy SUN HAT with Detachable Flower. I love the SUMMER FUN...Custom Flower Crochet Beanie Hat in White...HOT PINK PEONY FLOWER with VINTAGE BUTTON...for TODDLERS and BIG GIRLS!! I love being a girl because I get to wear girly things and accessorize!!! I have three sisters so it's lots of fun! I love the Custom Flower Crochet Beanie Hat for TODDLERS and BIG GIRLS in Light Pink...with Hot Pink Rose! Thanks for the chance to win. The best part of being a girl is the shoes, of course! I love being a girl because I get to pick out all kinds of frilly lacy fun things to wear. I like the Sweet Butterfly Clippies. Oh, me too!! I am not surprised I have a baby girl as my first child, I have the soft spot for anything girly! anyway HEADBAND HOLDE in Chocolate and Pink Gerber Daisy is such an invention! The most fun of being a girl is "dressing up"!! I can wear a skirt, mini or full length, I can wear short, skort, or even trousers, jeans anything!! Not to mention we have the freedom to wear the clothing in any color we want!! from black to pink! Love the Sweetheart Vintage Rosette stretch lace headband from the shop.